We are back with our annual visit to CERN, the European Center of Nuclear Research! Do not miss this incredible opportunity to explore the world of particle physics. For this year’s edition, the trip will start on April 27th, and as in the previous years it will go on for four days. Accommodation will be at the IBIS Budget Hotel as well as the Geneva Youth Hostel, which is a well-known hostel. Sadly the hostel was not available for the whole time of our stay so that the group will move after the first night. 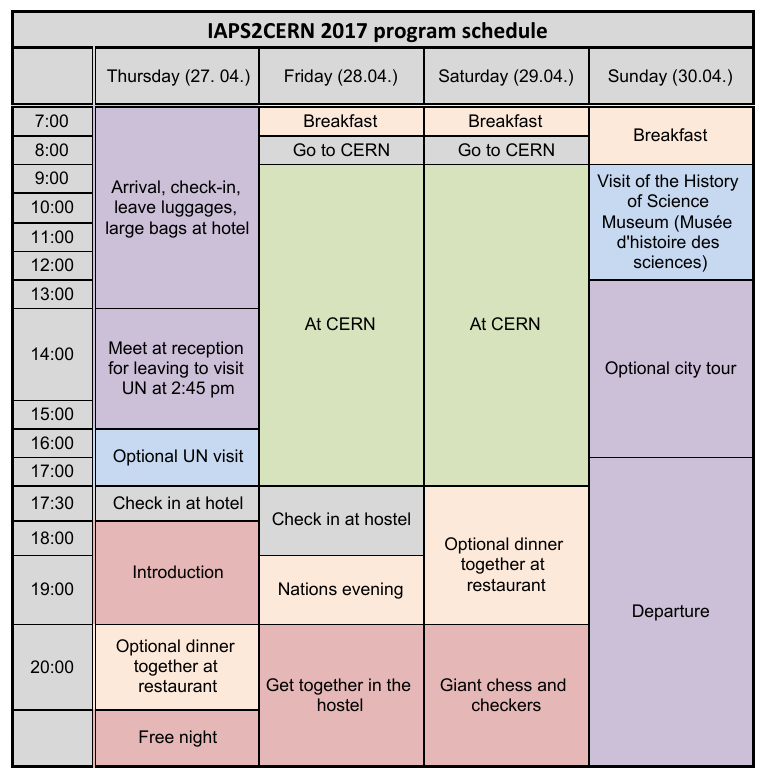 We will be visiting CERN on the 28th and 29th where we will be welcomed by a set of presentations and a tour of the CERN facilities. On the first day, April 27th, we have an optional visit to the United Nations office in Geneva which will cost an additional €10. We will hopefully manage to visit the University of Geneva on the last day and then stay to visit the city itself before departure in the evening. 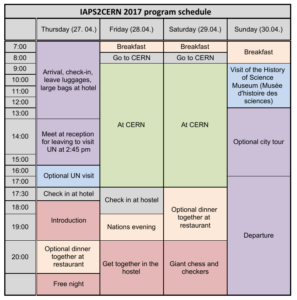 During the trip breakfast will be served at the hotel and Youth Hostel, and lunch can be bought from the CERN restaurant, where you will be free to talk to CERN researchers and engineers. Dinners will be in the city center of Geneva. The second evening is planned to spend together in the Youth Hostels common room. For those of you who have been to an ICPS before have for sure heard of the Nations Evening. This is planned as a cold buffet. Although the hostel also has a small kitchen offering a microwave to heat meals. So go ahead and bring some national foods and drinks with you when you go to Geneva. The registration is already closed. Sorry! See the planned schedule below for more detailed information. More info for participants can be found in the survival guide and the CERN program. We strongly suggest you to print the pamphlets or download them to your mobile device. The participation fee includes accommodation for the three nights, breakfast and transportation. If you have any concern, questions, or suggestions, please contact sabrina.gronow(at)iaps(dot)info or andras.biricz(at)iaps(dot)info. Otherwise we’ll meet you on Thursday April 27th at the IBIS Budget Hotel. All data is subject to changes.